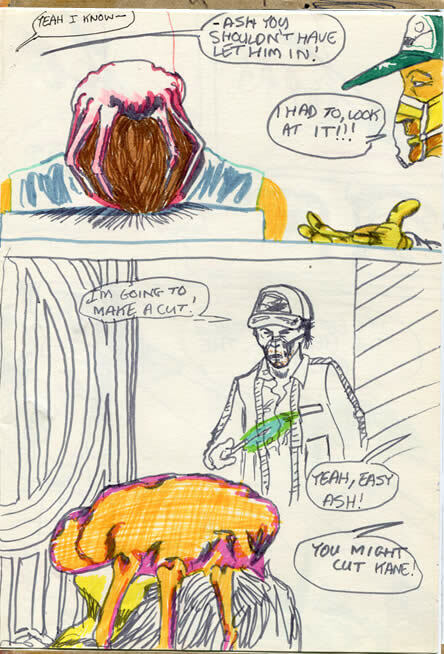 ALIEN age 11 - Comic/Graphic Novel and Blog: "You might cut Kane!" 1981? 1. (We see the Facehugger on Kane's face. Copied from Cracked Magazine) "Ash, you shouldn't have let him (Kane) in." Says Dallas or Ripley, scolding. "I had to look at it!!!" shouts 'Brash'—even though he looks perfectly calm. "Yeah, I know--" Replies the other, resignedly. 2. ('Brash' switches on a laser scalpel, which looks like mini-lightsaber', and prepares to cut the Facehugger which is attached to Kane's face) "I'm going to make a cut." He says. Yeah, easy Ash. you might cut Kane!" I've had to sacrifice the Star Wars age 9 website today in order to keep ALIEN age 11 running. My hosting provider shut me down today. A combination of a - possibly - hacked SWa9 site and massive traffic since word started to spread on the internet about Aa11 on Wednesday 1st of Feb! Kane looks like someone who's pissed off the chef in a seafood restaurant. Good old Cracked. 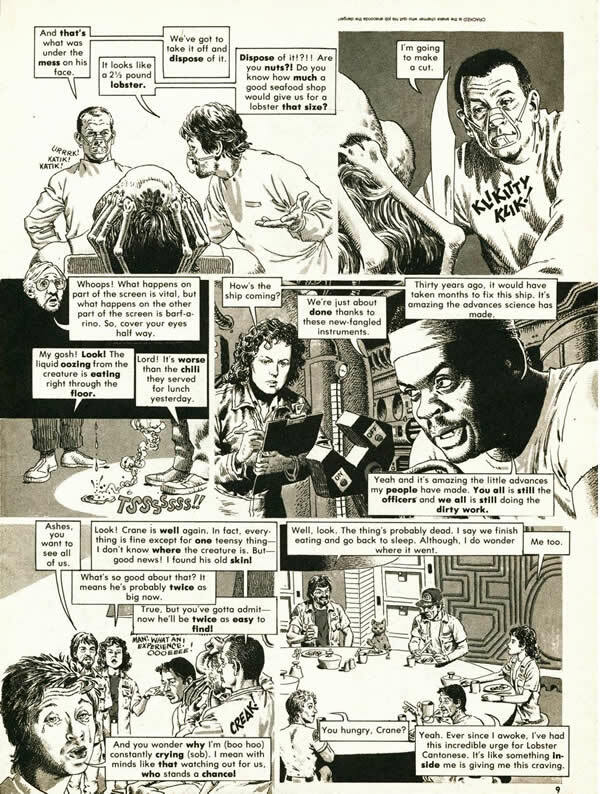 I reckon this page was from around '81 or so - putting me at about 13 years old. It features a better visualised face-hugger complete with knuckles - instead just looking like some floppy '50s B-Movie prop. I tell you what though: Kane looks like someone who's pissed off the chef in a seafood restaurant. Even though it was obvious from Cracked Magazine's brilliant artwork that Ash was NOT the smelly sweaty guy in the baseball hat, I must have decided: "I've come this far: 'might as well stick with it." "It looks like a 2 and a half pound lobster!" "They used real animal parts in the film..."
I think you can now clearly picture the look of an 11 year old boy revealing this gruesome fact to his friend? This made the unseen film all the more exciting! And, he was actually right. Oysters.